The iRay A6 is the latest most advanced innovation yet in our signature line of portable X-ray systems. 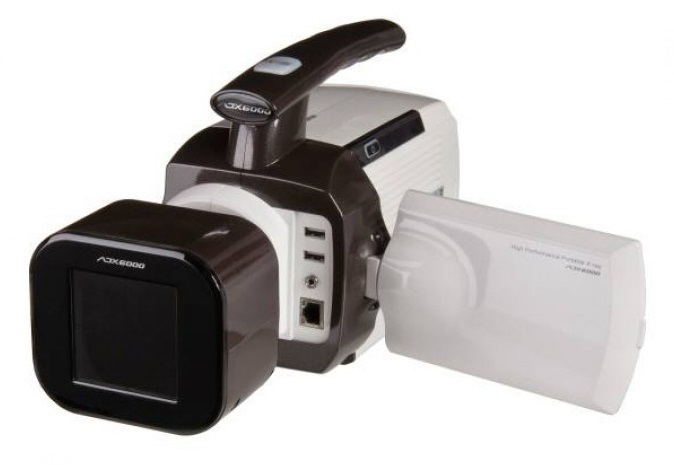 Truly a sight to behold, the iRay A6 comes equipped with fully adjustable power and the ability to interface to digital sensors, intraoral cameras, and large flat panel X-ray detectors. To call the iRay A6 versatile would be an understatement. Perfect for dental, medical, veterinary, military, industrial, and security uses, the iRay A6 is the solution for portable multipurpose radiography. Nullify location as an issue and perform your X-ray procedures or diagnoses anywhere in the world. Even a computer is not necessary as the iRay A6 has a built in processor and provides live viewing with an attached 4.8” color touch screen display. With the iRay A6, bring radiography to heights never seen before! • Multipurpose: Dental, Medical, Orthopedic, Cosmetic, Veterinary, Industrial/Military (nondestructive testing), Security, & more! • 5-joint stand arm available! Perfect for examinations, procedures, or diagnoses that must be performed on the spot!Concerned about safety? The iRay D system has repeatedly been shown, test after test, to be safer than conventional wall mount X-ray systems. At as low as 1/7 the power of conventional X-ray machines, the iRay D system minimizes exposure to harmful radiation while still maintaining comparable, if not superior, image quality. The X-ray generator and the cone of the iRay D systems are sealed with multiple layers of lead to negate any leakage radiation. And with the implementation of our backscatter shield, the operator is safe from X-rays reflecting off the patient during exposures. Certified by numerous sources as SAFE TO USE BY HAND.Still not convinced? We also offer a 5-jointed stand arm for which you can mount the iRay D machine. Comes fixated to a mobile cart so you still preserve the portable characteristics of the iRay system. 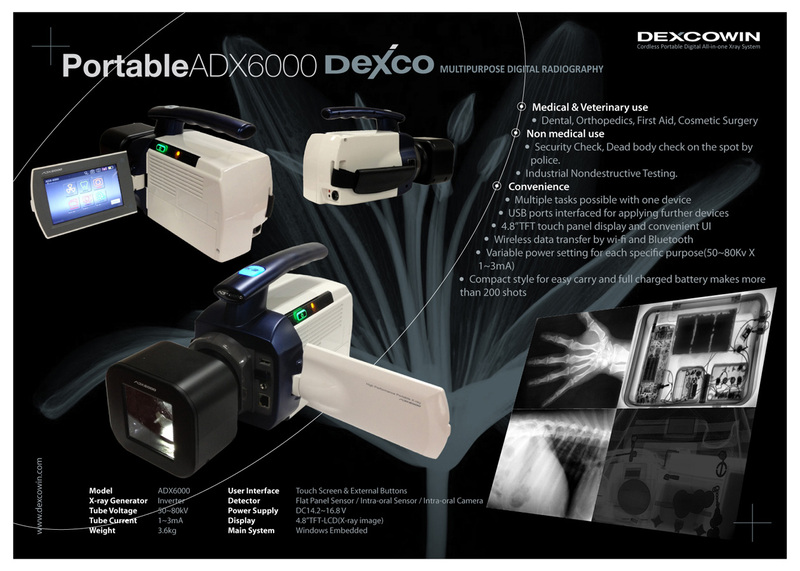 With an included remote control, satisfy any operator who still feels uneasiness with being in the same room as an X-ray machine.Please click here to view the brochures and sample images. Feel free to contact us if you have any questions. 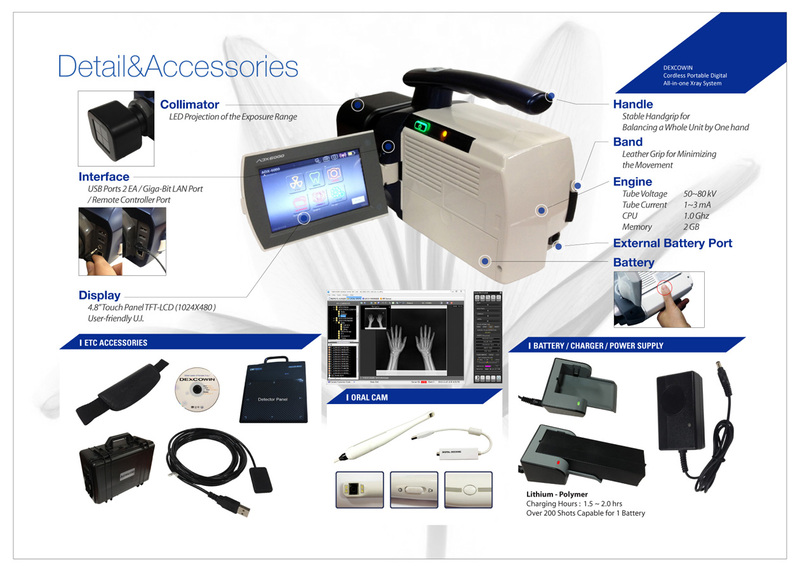 The iRay A6 is the machine for your portable radiographic needs. 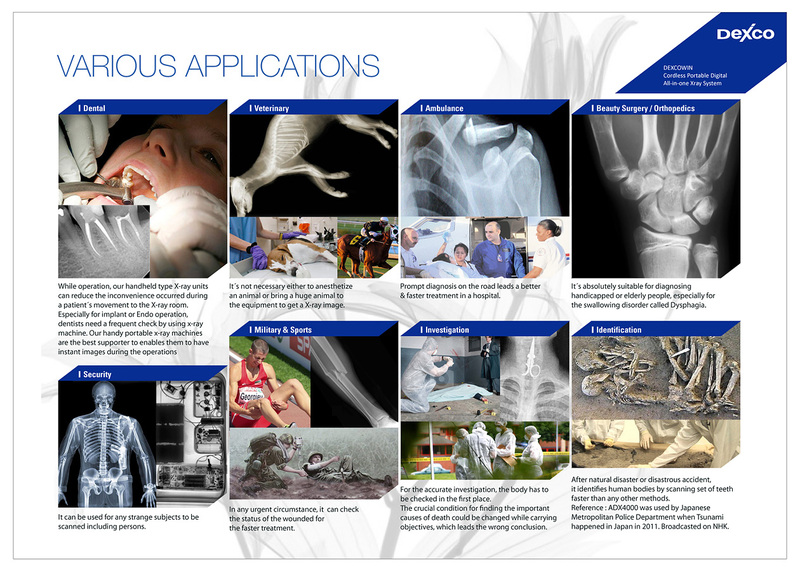 Whether you are a radiologist, a veterinarian, security personnel, scientist, or engineer, if you need to perform remote X-ray examinations, look no further, your solution has arrived. Equipped with an 8” x 10” flat panel X-ray (or 10” x 12”), the iRay A6 can give you on the spot live viewing so you can quickly diagnose the issue and move forward. With 16 Gb of internal storage, and wireless transfer capabilities, your images are safe wherever you go and easily ported from place to place. With the iRay A6, your mobile X-ray solution has arrived! iRay A6 use can be extendible to unlimited application which the X-ray image is needed for especially in mobile environment.